In his autobiography, Saint Paisius Velichkovsky calls his spiritual father Saint Basil the Hesychast "our common teacher and instructor, the most pious and holy elder and schema monk Basil." He was born near Poltava (Ukraine) in 1692 and is a representative of the Russian-Ukrainian monastic migration that occurred in the 18-19th centuries because of the reforms of Peter the Great in Russia and the persecution of the Orthodox believers in Ukraine which was under Polish rule. 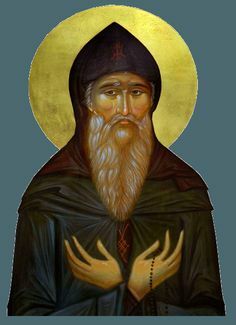 He went to Wallachia with his disciple Monk Michael and received monastic tonsure at Dalhautsi-Focshani Skete in 1705 or 1706, laboring in asceticism with great fervor. There he studied the depths of the Holy Scriptures and read many writings of the Holy Fathers. Saint Basil was ordained to the holy priesthood and became abbot of Dalhautsi in 1715. He remained in that position for twenty years, and was a wise instructor of about forty monks, teaching them obedience, humility, and the art of Noetic Prayer. The art of Noetic Prayer he learned at the Pocrov Skete, initiated by Saint Pachomius the Bishop of Roman (+ 1726), decades before the compilation of the Philokalia. The fame of this great spiritual father began to spread, so that even Prince Constantine Mavrocordat heard of him. Saint Basil’s community became known as a spiritual school of hesychasm, based on the wisdom of the Holy Fathers. When the number of his disciples increased until there was no longer room for all of them at Dalhautsi, they settled in other Sketes in the area (Trestieni, Ciolanu, Carnu, Ratesti, Rogoz, Bonţăşti, and Black Valley). In this way, his influence and teaching spread to other places, inspiring a spiritual renewal of Romanian monastic life in the eighteenth century. 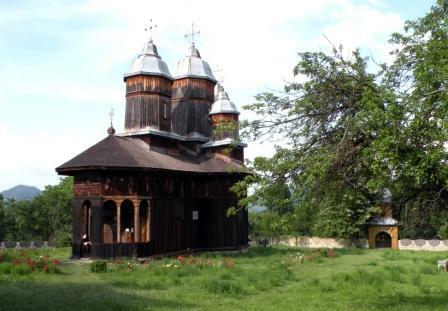 Saint Basil renovated the Poiana Manului (Apple Orchard) Skete near the city of Romni-Sarat between 1730-1733, then moved there with twelve disciples. In addition to his duties as abbot of Poiana Marului, Saint Basil was the spiritual guide of all the Sketes in the Buzau Mountains. One of his most famous disciples was Saint Paisius Velichkovsky, whom he received initially at Trestieni Skete for some years, and tonsured him when both were at Mount Athos in 1750. After he returned from Mount Athos, he established the community at Neamţ, which became the focus of the Hesychast communities in the eighteenth century. The rule of Abbot Basil called for a harmonious coenobitic life, daily reading of the Scriptures and the Holy Fathers, the practice of Noetic Prayer, pure guarding of the nous, one meal a day, and weekly Communion. The holy Elder Basil also wrote introductions to the writings of Saints Gregory of Sinai, Nilus of Sora, Philotheos Kokkinos and others who wrote about the spiritual life, guarding the nous, and on Noetic Prayer. He taught that the Holy Scriptures are a “saving medicine” for the soul, and recommended reading the Holy Fathers in order to obtain a correct understanding of Scripture, and to avoid being led astray through misunderstanding. Saint Basil also warned against any inclination to excuse ourselves and our sins, for this hinders true repentance. Saint Basil fell asleep in the Lord on April 25, 1767, leaving behind many disciples. He was buried in the yard of Poiana Marului Skete, probably somewhere near the Church dedicated to All Saints, founded in 1730 by him. So far his holy relic has not been found. The holy life of Saint Basil was well known in his time and until today. 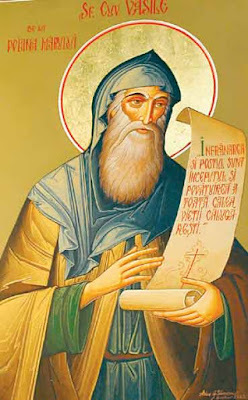 That is why the Holy Synod of the Romanian Orthodox Church, at its meeting on 4-5 March 2003, decided that the Abbot of Poiana Marului shall be venerated together with the Venerable and God-bearing Fathers, having his special feast day on April 25, when he departed to the Lord. "This pious servant of God far surpassed everyone in his understanding of divine Scripture and the teaching of the holy fathers, in spiritual discernment, and in his thorough knowledge of the sacred canons of the holy Church and interpretation of them in accordance with the commentaries of Zonaras, Theodore Balsamon, and others. The fame of his teaching and pious direction toward the path of salvation went out everywhere. When I saw him, I glorified God because He had deemed me worthy to see such a holy man." "Yes, we sin every day, at times unconsciously or out of forgetfulness, without intending to or involuntarily, or because of weakness we sin every day willingly and unwillingly. Because of our human nature and weakness we sin every day willingly and unwillingly. Is this not what the apostle Paul refers to when he says, 'I do what I do not want and what I do not want is what I do' (Romans 7:15)? All of us commit excusable sins without asking to be excused. Or rather, we fall into sins that can be forgiven and yet we feel no contrition and thus become guilty of God’s judgment and bring God’s wrath upon ourselves. In the words of an ancient saying, 'we have made a habit of sitting with her own free will'–– that is, we are consciously aware of committing sins and have developed the habit of sitting with our own free will." “One who forces himself in obedience for Christ alone and submits themselves to his precepts will find relief from his passions. The one who forces himself for the things of the world hoping to obtain prestige and riches along with physical pleasures is unaware of his burden. This is why the fathers rightly say that there is obedience for God's sake and obedience for the devil's sake.... As for us, let us force ourselves to demonstrate the power of obedience for the sake of God." “Take care in reading the Scriptures, and if you aren’t human, you will make from yourself a human, because reading the Scriptures is a healing well and saving craft. However, it is very important not to understand wrongly the Scriptures and misunderstanding the Scriptures is like a deep chasm. Therefore we need to know the writings of the Fathers and other ascetics who help us to the way of salvation." "'Lord Jesus Christ, Son of God, have mercy on me a sinner,' -- beyond all doubt this will obtain forgiveness of sins for him, and with this prayer also he will fulfill his entire rule, following the example of that widow of the Gospel who used to cry out to the judge day and night claiming her do (Luke 18:1–8 )." St. 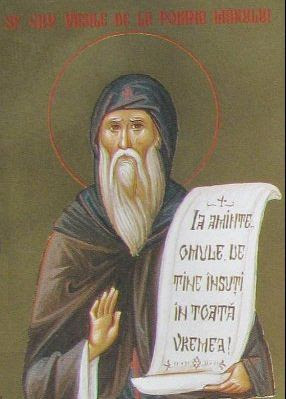 Basil of Poiana Marului said to disciples that monasticism has three paths: the community life, the living in small groups of two or three called “the middle” or “royal” path having all in common, and the third is the wilderness which is the highest done only by the holy and perfect ones, and this after they went through the first two paths. But some monks choose another way, in outer obedience and blessing. They make their cell wherever they want and live alone, caring more for the body.